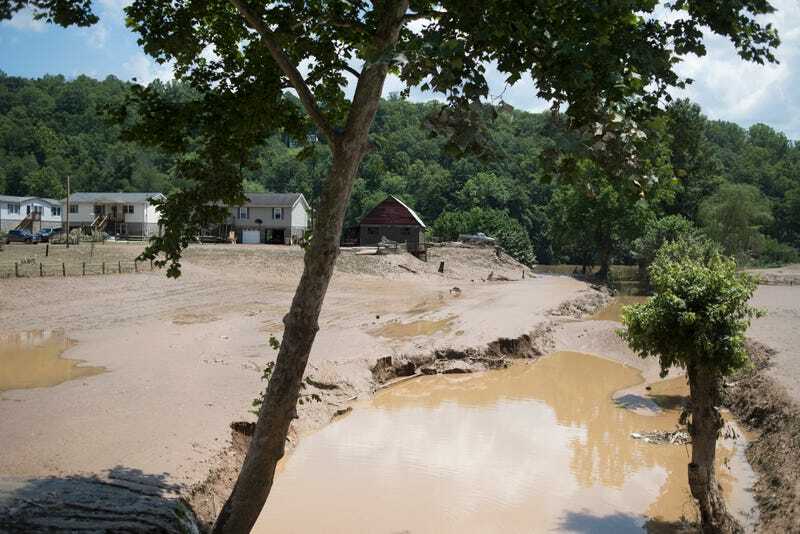 Farmland and crops are covered by mud from the flooding of the Elk River June 25, 2016, in Falling Rock, W. Va. The flooding of the Elk River claimed the lives of at least 24 people in West Virginia. President Barack Obama signed the West Virginia Disaster Declaration after severe flash flooding left at least 24 people dead and wreaked havoc on communities. According to NPR, the historic floods are the worst the state has seen in a century, destroying or seriously damaging at least 100 homes. In some areas, water levels reached as high as the rooftops, and more than 30,000 were left without power. With Obama's declaration Saturday, federal funding will be made available to Greenbrier, Kanawha and Nicholas, three of the hardest-hit counties. Assistance can include grants for "temporary housing and home repairs, low-cost loans to cover uninsured property losses, and other programs to help individuals and business owners recover from the effects of the disaster," the White House said in a release. "Federal funding also is available to state and eligible local governments and certain private nonprofit organizations on a cost-sharing basis for emergency protective measures in the counties of Greenbrier, Kanawha, and Nicholas," the White House continued. "Federal funding is also available on a cost-sharing basis for hazard-mitigation measures statewide." West Virginia Gov. Earl Ray Tomblin released a statement of his own, acknowledging that the federal support will "provide much needed assistance to severely impacted regions."